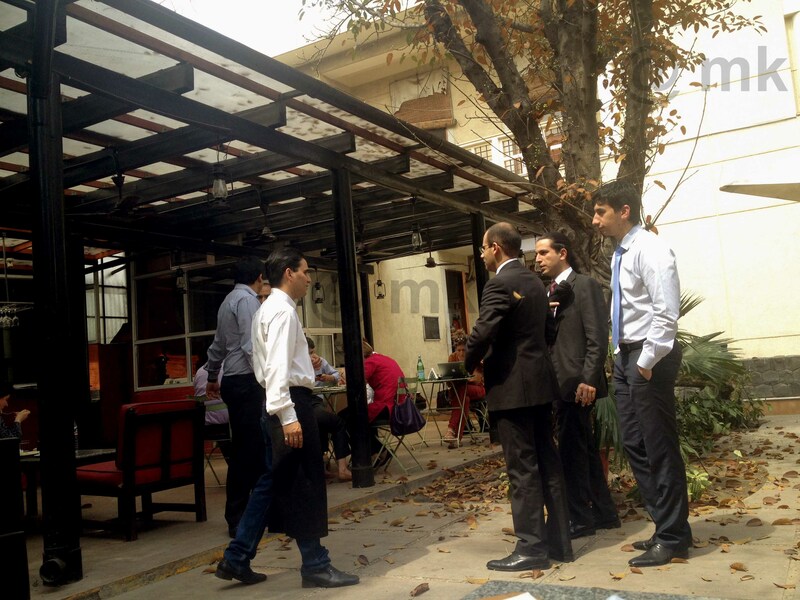 I was completely oblivious to the Italian Cultural Centre situated inside the Italian Embassy in heart of New Delhi, until one of my friends, who is a member, suggested we do our monthly bachelor lunch at the Café. A spring afternoon, a drive through wide roads of Delhi’s diplomatic area, the company of friends and a walk through the lush greens of ICC, despite being a week day, put us in the mood for a great foodie afternoon. The Café at ICC is run by Ritu Dalmia (DIVA restaurants) who has become synonymous with Italian “Khana” in the Indian foodie circles. You can always rely on Ritu and her chefs for quality and authenticity of the cuisine she loves so dearly. I am sure a lot of you would be able to vouch for this fact if you have tried any one of her DIVA restaurants around Delhi. The walk towards the outdoor area of the café promises you a rare experience, unlike any one would ever experience in a big city. The café is divided into the outdoor patio area and the indoor dining hall. If you cannot bear the Delhi heat even mildly, the indoor is air-conditioned and should be the choice during reservations. However, we preferred the patio which has more character with huge trees around which the furniture is laid out. The simple furniture, which could be part of any college canteen, gives this quaint café a rustic appeal, though you can choose a couch seating with a semi-covered pergola. The kitchen overlooks the outdoor area and this is another reason to enjoy your meal on the patio. Plus I never think there is too much heat which a chilled beer cannot cure. You can only visit the restaurant if you or one of the diners in your group is a member. The membership I think is INR 2000/ year and can be done online. Each person visiting must carry a valid ID to enter the embassy area for security reasons. The staff is very courteous and extremely efficient from getting you to your table to handing over your menu. They have been trained well to stay close but not intrude and not overburden the guests. The servers know the food they are serving pretty well and indulge you with suggestions if you are looking for some. I would suggest you tell them your preferences and try out a suggestion by the server if you are confused by the array of dishes on the menu. The service is fast and friendly and the staff makes sure you have a good time along with the good food. 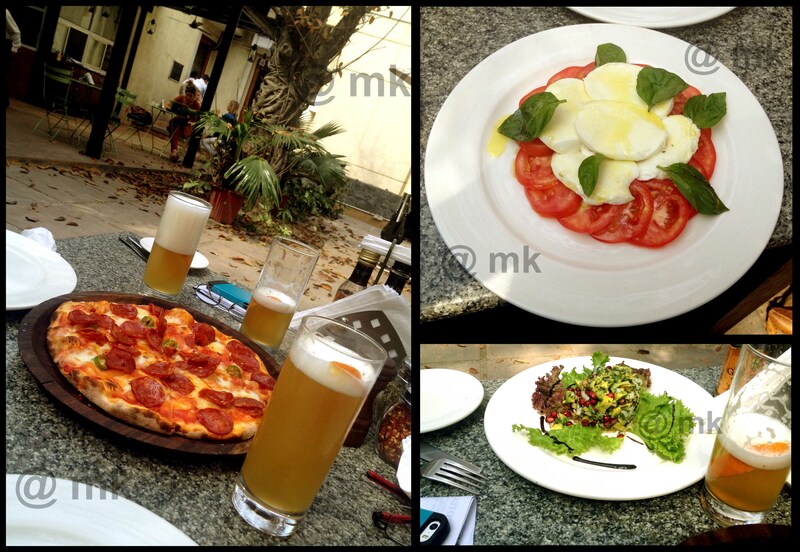 The afternoon started with a round of chilled beers (Hoegarden) with the good old Pepperoni Pizza, Insalata Caprese & a Prawn Salad. The Insalata Caprese is sliced fresh Buffalo Mozzarella cheese topped with round sliced tomatoes and basil leaves drizzled with extra virgin Olive oil. Completely vegetarian this definitely caught my fancy and the cheese was just exquisite, nothing like I have ever tasted in India before. The Prawn Salad called the Tartara di Gamberi con Avocado was Prawn tartar served with Avocado and Pomegranate with a lime dressing. Though I am not a big fan of pomegranate, the prawn with the avocado was an excellent mix. The Pepperoni pizza was highly recommended by my friend and a personal favorite of mine, it was one of the best I have had. The pizza base perfectly crusty and chewy made fresh in their wood fired oven with the flavor of sauce completely merging in it. The Pepperoni was fresh and cooked well, with liberal quantities of topping so that you did not have to save it for the last bite (like the one pepperoni per slice pizzas). The thing that tipped the scales from great to the best was addition of green chillies to the topping and giving the pizza requisite spice. This is where the beer did its job and even though it was a work afternoon, the light buzz was helpful (at least to me). 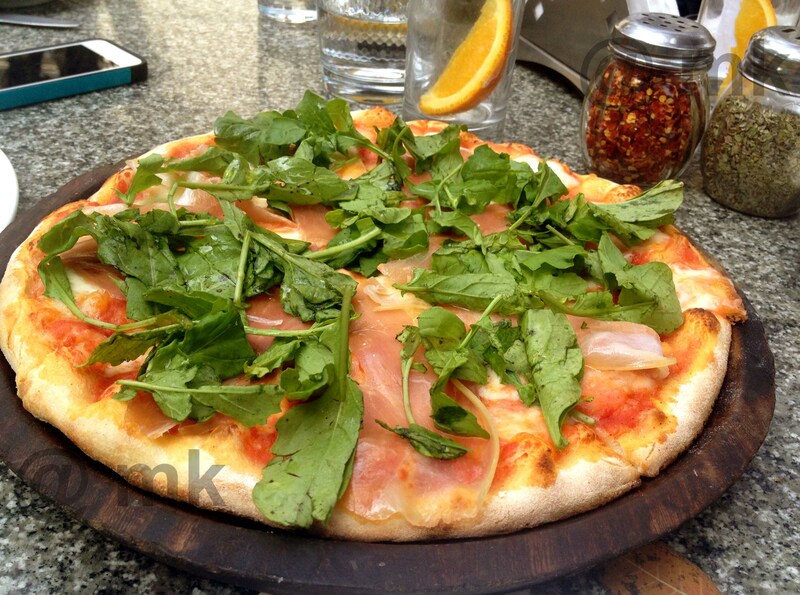 The Parma Ham and rocket pizza … a little too bland for my taste. We were not ordering as per the courses and just picked whatever caught our fancy next. The next round consisted of the Tortelli Ripeni Di Carne Ai Funghi, the Spaghetti el Pomodoro e Basilico, and the Parma Ham & Rocket pizza with Mozzarella (La Mia Perferita). Having already tasted the Pepperoni pizza the Parma Ham and rocket toppings did not do much for my taste buds and were a little too bland for me. The Spaghetti was amazingly simple but the flavor of each herb and ingredient did maintain its individuality inside my mouth. 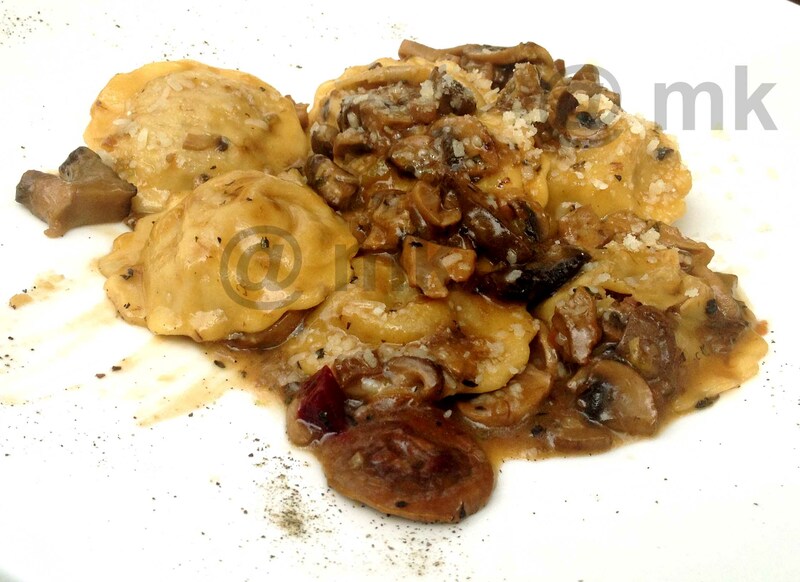 The Tortelli, Parcels filled with minced meat cooked in mushroom sauce are a great option if you love pastas and meat. The Parcels are coated with a heavy dose of mushroom sauce and the minced meat bound well inside which prevents it from falling out awkwardly once you take bite. The mushrooms are cooked well (slightly over) but that is the way I prefer them. We had already devoured six different dishes among 3 of us and there was another one which caught our attention mainly because of its bright red color. 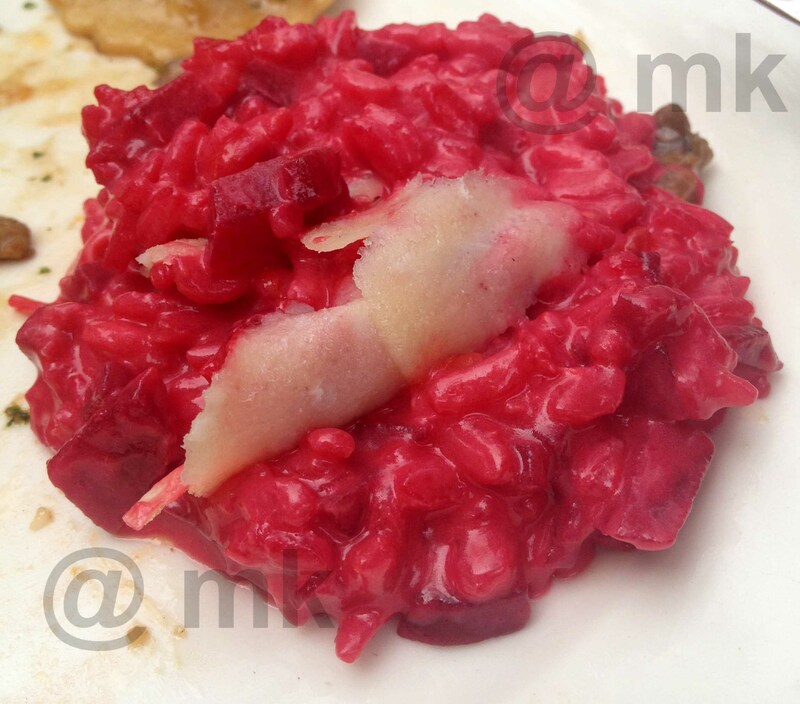 The Risotto with beetroot, orange juice made in sheep milk cheese had a distinct flavor and aroma of the cheese. We were already upto our limit but the Risotto was hard to resist, mainly because of the aroma and the smooth flavor, and so soft that it melted in the mouth like the cheese. 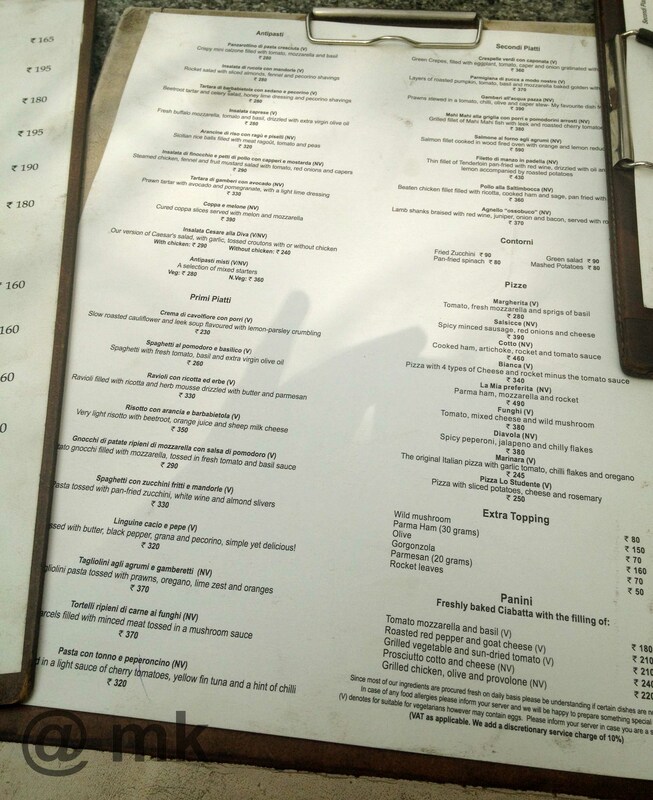 The Menu on a clipboard lends to the rustic feel of the place. My only grouse would be that by the end of the meal none of us had any place for the desserts which I hear are amazing. I will definitely have to go back for them soon. A great place to chill and have amazing food either with friends or on a romantic date, this one is not to be missed. This entry was posted in Food, India, Lifestyle, Photography, Restaurant, Review, Uncategorized and tagged Cafe at ICC, DIVA, Insalata Caprese, Italian Cultural Center, Italian food, Menu, Pepperoni Pizza, Ritu Dalmia. Bookmark the permalink. Is it open for all ?